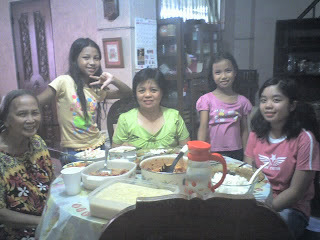 Its my Mom’s birthday last May 30, 2008 and instead of celebrating it on other venue we decided to just celebrate it simply on our home. We earlier planned to have it at her hometown in Laguna but later decided to have a simple birthday only with close family, close friends and some relatives only. Last year was a happy, fun and quite relaxing also as we had it at Bosay Resort in Antipolo, Rizal. 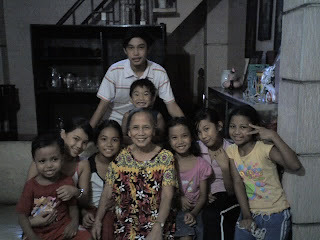 Our relatives in Laguna were there together with friends and family. It wasn’t raining that day so we really enjoyed swimming, eating and celebrating her 75th birthday that day. This year’s birthday is very quiet as we didn’t invite anyone save for a few who has been with her most of the time and visits her frequently. This is quite different as we always have plenty of guests until evening. This time we had more time to sit, relax and talk to close friends and guests. You don’t have to entertain them as they’re very close and most are our own family. Her relatives in Laguna didn’t make it as my cousin who planned the birthday visit to my mother suddenly felt ill and we advised her to just rest and visit my Mom when she’s well. They talked on the phone and my Mom was happy enough that she’s talked with her brother Uncle Ipeng and her daughter Ka Duneng, nieces and grandchildren. 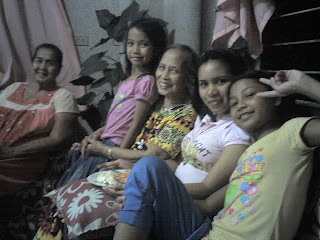 Ka Duneng is my Mom’s daughter also as she’s lived with her when my Mom before Mom got married. I’ve cooked the family’s favorite hamonado, chicken and the usual spaghetti. Redge and I prepared lots of dessert like macaroni salad, fruit salad and many more. 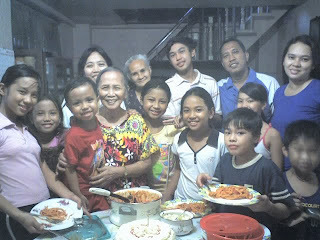 My family was so fond of salad and it includes my youngest Josh who never stopped eating macaroni salad and Gen on her fruit salad. One of Mom’s niece brought a red ribbon chocolate cake and to match that I’ve bought ice cream. We thanked God that He has given us a mother that’s so caring, loving and never miss a day and moment in her life praying and thanking God for all the wonderful blessings that she had in her life. She always told her friends that she loves us dearly. Happy Birthday Mom! We love you so much! Happy Birthday to your Mom! I heard from Jo (my cousin) how warm and kind your mom is. So cheers!